Hand woven PVC wicker shade. Not only did I buy a couple of these lamps for the pool area but for my bedroom and living room as well. They look fabulous and will never go out of style. 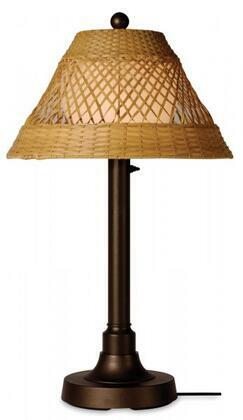 I shopped far & wide to find a suitable lamp to replace the lamp on our screened porch that gets tons of moisture. We were blown away at the quality of this lamp... Looks so beautiful .. Very happy with the purchase !